For other uses, see Spacetime (disambiguation). Non-relativistic classical mechanics treats time as a universal quantity of measurement which is uniform throughout space and which is separate from space. Classical mechanics assumes that time has a constant rate of passage that is independent of the state of motion of an observer, or indeed of anything external. Furthermore, it assumes that space is Euclidean, which is to say, it assumes that space follows the geometry of common sense. In the context of special relativity, time cannot be separated from the three dimensions of space, because the observed rate at which time passes for an object depends on the object's velocity relative to the observer. General relativity, in addition, provides an explanation of how gravitational fields can slow the passage of time for an object as seen by an observer outside the field. In ordinary space, a position is specified by three numbers, known as dimensions. In the Cartesian coordinate system, these are called x, y, and z. A position in spacetime is called an event, and requires four numbers to be specified: the three-dimensional location in space, plus the position in time (Fig. 1). Spacetime is thus four dimensional. An event is something that happens instantaneously at a single point in spacetime, represented by a set of coordinates x, y, z and t.
The word "event" used in relativity should not be confused with the use of the word "event" in normal conversation, where it might refer to an "event" as something such as a concert, sporting event, or a battle. These are not mathematical "events" in the way the word is used in relativity, because they have finite durations and extents. Unlike the analogies used to explain events, such as firecrackers or lightning bolts, mathematical events have zero duration and represent a single point in spacetime. (conventionally called the speed-of-light) relates distances measured in space with distances measured in time. The magnitude of this scale factor (nearly 300,000 kilometres or 190,000 miles in space being equivalent to one second in time), along with the fact that spacetime is a manifold, implies that at ordinary, non-relativistic speeds and at ordinary, human-scale distances, there is little that humans might observe which is noticeably different from what they might observe if the world were Euclidean. It was only with the advent of sensitive scientific measurements in the mid-1800s, such as the Fizeau experiment and the Michelson–Morley experiment, that puzzling discrepancies began to be noted between observation versus predictions based on the implicit assumption of Euclidean space. Figure 1-1. Each location in spacetime is marked by four numbers defined by a frame of reference: the position in space, and the time (which can be visualized as the reading of a clock located at each position in space). The 'observer' synchronizes the clocks according to their own reference frame. In special relativity, an observer will, in most cases, mean a frame of reference from which a set of objects or events are being measured. This usage differs significantly from the ordinary English meaning of the term. Reference frames are inherently nonlocal constructs, and according to this usage of the term, it does not make sense to speak of an observer as having a location. In Fig. 1‑1, imagine that the frame under consideration is equipped with a dense lattice of clocks, synchronized within this reference frame, that extends indefinitely throughout the three dimensions of space. Any specific location within the lattice is not important. The latticework of clocks is used to determine the time and position of events taking place within the whole frame. The term observer refers to the entire ensemble of clocks associated with one inertial frame of reference. :17–22 In this idealized case, every point in space has a clock associated with it, and thus the clocks register each event instantly, with no time delay between an event and its recording. A real observer, however, will see a delay between the emission of a signal and its detection due to the speed of light. To synchronize the clocks, in the data reduction following an experiment, the time when a signal is received will be corrected to reflect its actual time were it to have been recorded by an idealized lattice of clocks. In many books on special relativity, especially older ones, the word "observer" is used in the more ordinary sense of the word. It is usually clear from context which meaning has been adopted. Physicists distinguish between what one measures or observes (after one has factored out signal propagation delays), versus what one visually sees without such corrections. Failure to understand the difference between what one measures/observes versus what one sees is the source of much error among beginning students of relativity. Figure 1-2. Michelson and Morley expected that motion through the aether would cause a differential phase shift between light traversing the two arms of their apparatus. The most logical explanation of their negative result, aether dragging, was in conflict with the observation of stellar aberration. By the mid-1800s, various experiments such as the observation of the Arago spot (a bright point at the center of a circular object's shadow due to diffraction) and differential measurements of the speed of light in air versus water were considered to have proven the wave nature of light as opposed to a corpuscular theory. Propagation of waves was then assumed to require the existence of a medium which waved: in the case of light waves, this was considered to be a hypothetical luminiferous aether. [note 1] However, the various attempts to establish the properties of this hypothetical medium yielded contradictory results. For example, the Fizeau experiment of 1851 demonstrated that the speed of light in flowing water was less than the sum of the speed of light in air plus the speed of the water by an amount dependent on the water's index of refraction. Among other issues, the dependence of the partial aether-dragging implied by this experiment on the index of refraction (which is dependent on wavelength) led to the unpalatable conclusion that aether simultaneously flows at different speeds for different colors of light. The famous Michelson–Morley experiment of 1887 (Fig. 1‑2) showed no differential influence of Earth's motions through the hypothetical aether on the speed of light, and the most likely explanation, complete aether dragging, was in conflict with the observation of stellar aberration. By 1904, Lorentz had expanded his theory such that he had arrived at equations formally identical with those that Einstein were to derive later (i.e. the Lorentz transform), but with a fundamentally different interpretation. As a theory of dynamics (the study of forces and torques and their effect on motion), his theory assumed actual physical deformations of the physical constituents of matter. :163–174 Lorentz's equations predicted a quantity that he called local time, with which he could explain the aberration of light, the Fizeau experiment and other phenomena. However, Lorentz considered local time to be only an auxiliary mathematical tool, a trick as it were, to simplify the transformation from one system into another. Other physicists and mathematicians at the turn of the century came close to arriving at what is currently known as spacetime. Einstein himself noted, that with so many people unraveling separate pieces of the puzzle, "the special theory of relativity, if we regard its development in retrospect, was ripe for discovery in 1905." An important example is Henri Poincaré,:73–80,93–95 who in 1898 argued that the simultaneity of two events is a matter of convention. [note 2] In 1900, he recognized that Lorentz's "local time" is actually what is indicated by moving clocks by applying an explicitly operational definition of clock synchronization assuming constant light speed. [note 3] In 1900 and 1904, he suggested the inherent undetectability of the aether by emphasizing the validity of what he called the principle of relativity, and in 1905/1906 he mathematically perfected Lorentz's theory of electrons in order to bring it into accordance with the postulate of relativity. While discussing various hypotheses on Lorentz invariant gravitation, he introduced the innovative concept of a 4-dimensional space-time by defining various four vectors, namely four-position, four-velocity, and four-force. He did not pursue the 4-dimensional formalism in subsequent papers, however, stating that this line of research seemed to "entail great pain for limited profit", ultimately concluding "that three-dimensional language seems the best suited to the description of our world". Furthermore, even as late as 1909, Poincaré continued to believe in the dynamical interpretation of the Lorentz transform. :163–174 For these and other reasons, most historians of science argue that Poincaré did not invent what is now called special relativity. In 1905, Einstein introduced special relativity (even though without using the techniques of the spacetime formalism) in its modern understanding as a theory of space and time. While his results are mathematically equivalent to those of Lorentz and Poincaré, it was Einstein who showed that the Lorentz transformations are not the result of interactions between matter and aether, but rather concern the nature of space and time itself. He obtained all of his results by recognizing that the entire theory can be built upon two postulates: The principle of relativity and the principle of the constancy of light speed. In addition, Einstein in 1905 superseded previous attempts of an electromagnetic mass-energy relation by introducing the general equivalence of mass and energy, which was instrumental for his subsequent formulation of the equivalence principle in 1907, which declares the equivalence of inertial and gravitational mass. By using the mass-energy equivalence, Einstein showed, in addition, that the gravitational mass of a body is proportional to its energy content, which was one of early results in developing general relativity. While it would appear that he did not at first think geometrically about spacetime,:219 in the further development of general relativity Einstein fully incorporated the spacetime formalism. Minkowski had been concerned with the state of electrodynamics after Michelson's disruptive experiments at least since the summer of 1905, when Minkowski and David Hilbert led an advanced seminar attended by notable physicists of the time to study the papers of Lorentz, Poincaré et al. However, it is not at all clear when Minkowski began to formulate the geometric formulation of special relativity that was to bear his name, or to which extent he was influenced by Poincaré's four-dimensional interpretation of the Lorentz transformation. Nor is it clear if he ever fully appreciated Einstein's critical contribution to the understanding of the Lorentz transformations, thinking of Einstein's work as being an extension of Lorentz's work. Einstein, for his part, was initially dismissive of Minkowski's geometric interpretation of special relativity, regarding it as überflüssige Gelehrsamkeit (superfluous learnedness). However, in order to complete his search for general relativity that started in 1907, the geometric interpretation of relativity proved to be vital, and in 1916, Einstein fully acknowledged his indebtedness to Minkowski, whose interpretation greatly facilitated the transition to general relativity. :151–152 Since there are other types of spacetime, such as the curved spacetime of general relativity, the spacetime of special relativity is today known as Minkowski spacetime. Although two viewers may measure the x,y, and z position of the two points using different coordinate systems, the distance between the points will be the same for both (assuming that they are measuring using the same units). The distance is "invariant". In special relativity, however, the distance between two points is no longer the same if measured by two different observers when one of the observers is moving, because of Lorentz contraction. The situation is even more complicated if the two points are separated in time as well as in space. For example, if one observer sees two events occur at the same place, but at different times, a person moving with respect to the first observer will see the two events occurring at different places, because (from their point of view) they are stationary, and the position of the event is receding or approaching. Thus, a different measure must be used to measure the effective "distance" between two events. , the speed of light, converts the units used to measure time (seconds) into units used to measure distance (meters). , etc. We are always concerned with differences of spatial or temporal coordinate values belonging to two events, and since there is no preferred origin, single coordinate values have no essential meaning.
. In other words, the spacetime interval between two events on the world line of something moving at the speed of light is zero. Such an interval is termed lightlike or null. A photon arriving in our eye from a distant star will not have aged, despite having (from our perspective) spent years in its passage. so that it has the same units (meters) as the horizontal space coordinate. Since photons travel at the speed of light, their world lines have a slope of ±1. In other words, every meter that a photon travels to the left or right requires approximately 3.3 nanoseconds of time. These sign conventions are associated with the metric signatures (+ − − −) and (− + + +). A minor variation is to place the time coordinate last rather than first. Both conventions are widely used within the field of study. To gain insight in how spacetime coordinates measured by observers in different reference frames compare with each other, it is useful to work with a simplified setup with frames in a standard configuration. With care, this allows simplification of the math with no loss of generality in the conclusions that are reached. In Fig. 2‑2, two Galilean reference frames (i.e. conventional 3-space frames) are displayed in relative motion. Frame S belongs to a first observer O, and frame S′ (pronounced "S prime") belongs to a second observer O′. The x, y, z axes of frame S are oriented parallel to the respective primed axes of frame S′. Frame S′ moves in the x-direction of frame S with a constant velocity v as measured in frame S.
The x′ axis is also tilted with respect to the x axis. To determine the angle of this tilt, we recall that the slope of the world line of a light pulse is always ±1. Fig. 2‑3c presents a spacetime diagram from the viewpoint of observer O′. 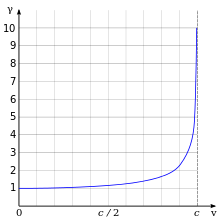 Event P represents the emission of a light pulse at x′ = 0, ct′ = −a. The pulse is reflected from a mirror situated a distance a from the light source (event Q), and returns to the light source at x′ = 0, ct′ = a (event R). While the rest frame has space and time axes that meet at right angles, the moving frame is drawn with axes that meet at an acute angle. The frames are actually equivalent. The asymmetry is due to unavoidable distortions in how spacetime coordinates can map onto a Cartesian plane, and should be considered no stranger than the manner in which, on a Mercator projection of the Earth, the relative sizes of land masses near the poles (Greenland and Antarctica) are highly exaggerated relative to land masses near the Equator. Figure 2-4. The light cone centered on an event divides the rest of spacetime into the future, the past, and "elsewhere"
In Fig. 2-4, event O is at the origin of a spacetime diagram, and the two diagonal lines represent all events that have zero spacetime interval with respect to the origin event. These two lines form what is called the light cone of the event O, since adding a second spatial dimension (Fig. 2‑5) makes the appearance that of two right circular cones meeting with their apices at O. One cone extends into the future (t>0), the other into the past (t<0). The light cone has an essential role within the concept of causality. It is possible for a not-faster-than-light-speed signal to travel from the position and time of O to the position and time of D (Fig. 2‑4). It is hence possible for event O to have a causal influence on event D. The future light cone contains all the events that could be causally influenced by O. Likewise, it is possible for a not-faster-than-light-speed signal to travel from the position and time of A, to the position and time of O. The past light cone contains all the events that could have a causal influence on O. In contrast, assuming that signals cannot travel faster than the speed of light, any event, like e.g. B or C, in the spacelike region (Elsewhere), cannot either affect event O, nor can they be affected by event O employing such signalling. Under this assumption any causal relationship between event O and any events in the spacelike region of a light cone is excluded. All observers will agree that for any given event, an event within the given event's future light cone occurs after the given event. Likewise, for any given event, an event within the given event's past light cone occurs before the given event. The before-after relationship observed for timelike-separated events remains unchanged no matter what the reference frame of the observer, i.e. no matter how the observer may be moving. The situation is quite different for spacelike-separated events. Fig. 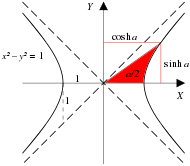 2‑4 was drawn from the reference frame of an observer moving at v = 0. From this reference frame, event C is observed to occur after event O, and event B is observed to occur before event O. From a different reference frame, the orderings of these non-causally-related events can be reversed. In particular, one notes that if two events are simultaneous in a particular reference frame, they are necessarily separated by a spacelike interval and thus are noncausally related. The observation that simultaneity is not absolute, but depends on the observer's reference frame, is termed the relativity of simultaneity. Fig. 2-6 illustrates the use of spacetime diagrams in the analysis of the relativity of simultaneity. The events in spacetime are invariant, but the coordinate frames transform as discussed above for Fig. 2‑3. The three events (A, B, C) are simultaneous from the reference frame of an observer moving at v = 0. From the reference frame of an observer moving at v = 0.3 c, the events appear to occur in the order C, B, A. From the reference frame of an observer moving at v = −0.5 c, the events appear to occur in the order A, B, C. The white line represents a plane of simultaneity being moved from the past of the observer to the future of the observer, highlighting events residing on it. The gray area is the light cone of the observer, which remains invariant. These equations describe two families of hyperbolae in an x–ct spacetime diagram, which are termed invariant hyperbolae. In Fig. 2‑7a, each magenta hyperbola connects all events having some fixed spacelike separation from the origin, while the green hyperbolae connect events of equal timelike separation. Fig. 2‑7b reflects the situation in (1+2)-dimensional Minkowski spacetime (one temporal and two spatial dimensions) with the corresponding hyperboloids. Each timelike interval generates a hyperboloid of one sheet, while each spacelike interval generates a hyperboloid of two sheets. 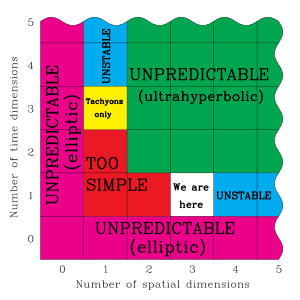 The (1+2)-dimensional boundary between space- and timelike hyperboloids, established by the events forming a zero spacetime interval to the origin, is made up by degenerating the hyperboloids to the light cone. In (1+1)-dimensions the hyperbolae degenerate to the two grey 45°-lines depicted in Fig. 2‑7a. Fig. 2-8 illustrates the invariant hyperbola for all events that can be reached from the origin in a proper time of 5 meters (approximately 6992167000000000000♠1.67×10−8 s). Different world lines represent clocks moving at different speeds. A clock that is stationary with respect to the observer has a world line that is vertical, and the elapsed time measured by the observer is the same as the proper time. For a clock traveling at 0.3c, the elapsed time measured by the observer is 5.24 meters (6992175000000000000♠1.75×10−8 s), while for a clock traveling at 0.7c, the elapsed time measured by the observer is 7.00 meters (6992233999999999999♠2.34×10−8 s). This illustrates the phenomenon known as time dilation. Clocks that travel faster take longer (in the observer frame) to tick out the same amount of proper time, and they travel further along the x–axis than they would have without time dilation. :220–221 The measurement of time dilation by two observers in different inertial reference frames is mutual. If observer O measures the clocks of observer O′ as running slower in his frame, observer O′ in turn will measure the clocks of observer O as running slower. Figure 2-9. In this spacetime diagram, the 1 m length of the moving rod, as measured in the primed frame, is the foreshortened distance OC when projected onto the unprimed frame. Length contraction, like time dilation, is a manifestation of the relativity of simultaneity. Measurement of length requires measurement of the spacetime interval between two events that are simultaneous in one's frame of reference. But events that are simultaneous in one frame of reference are, in general, not simultaneous in other frames of reference. (not illustrated) Drawing a vertical line through A so that it intersects the x' axis demonstrates that, even as OB is foreshortened from the point of view of observer O, OA is likewise foreshortened from the point of view of observer O′. In the same way that each observer measures the other's clocks as running slow, each observer measures the other's rulers as being contracted. In regards to mutual length contraction, 2‑9 illustrates that the primed and unprimed frames are mutually rotated by a hyperbolic angle (analogous to ordinary angles in Euclidean geometry). [note 8] Because of this rotation, the projection of a primed meter-stick onto the unprimed x-axis is foreshortened, while the projection of an unprimed meter-stick onto the primed x′-axis is likewise foreshortened. Basically, this apparent contradiction stems from not correctly taking into account the different settings of the necessary, related measurements. These settings allow for a consistent explanation of the only apparent contradiction. It is not about the abstract ticking of two identical clocks, but about how to measure in one frame the temporal distance of two ticks of a moving clock. It turns out that in mutually observing the duration between ticks of clocks, each moving in the respective frame, different sets of clocks must be involved. In order to measure in frame S the tick duration of a moving clock W' (at rest in S'), one uses two additional, synchronized clocks W1 and W2 at rest in two arbitrarily fixed points in S with the spatial distance d. Two events can be defined by the condition "two clocks are simultaneously at one place", i.e., when W' passes each W1 and W2. For both events the two readings of the collocated clocks are recorded. The difference of the two readings of W1 and W2 is the temporal distance of the two events in S, and their spatial distance is d. The difference of the two readings of W' is the temporal distance of the two events in S'. Note that in S' these events are only separated in time, they happen at the same place in S'. Because of the invariance of the spacetime interval spanned by these two events, and the nonzero spatial separation d in S, the temporal distance in S' must be smaller than the one in S: the smaller temporal distance between the two events, resulting from the readings of the moving clock W', belongs to the slower running clock W'. Conversely, for judging in frame S' the temporal distance of two events on a moving clock W (at rest in S), one needs two clocks at rest in S'. In this comparison the clock W is moving by with velocity -v. Recording again the four readings for the events, defined by "two clocks simultaneously at one place", results in the analogous temporal distances of the two events, now temporally and spatially separated in S', and only temporally separated but collocated in S. To keep the spacetime interval invariant, the temporal distance in S must be smaller than in S', because of the spatial separation of the events in S': now clock W is observed to run slower. Fig. 2-10 illustrates the previous discussion of mutual time dilation with Minkowski diagrams. The upper picture reflects the measurements as seen from frame S "at rest" with unprimed, rectangular axes, and frame S' "moving with v > 0", coordinatized by primed, oblique axes, slanted to the right; the lower picture shows frame S' "at rest" with primed, rectangular coordinates, and frame S "moving with −v < 0", with unprimed, oblique axes, slanted to the left. Each line drawn parallel to a spatial axis (x, x′) represents a line of simultaneity. All events on such a line have the same time value (ct, ct′). Likewise, each line drawn parallel to a temporal axis (ct, ct′) represents a line of equal spatial coordinate values (x, x′). One may designate in both pictures the origin O (= O′) as the event, where the respective "moving clock" is collocated with the "first clock at rest" in both comparisons. Obviously, for this event the readings on both clocks in both comparisons are zero. As a consequence, the worldlines of the moving clocks are the slanted to the right ct′-axis (upper pictures, clock W') and the slanted to the left ct-axes (lower pictures, clock W). The worldlines of W1 and W'1 are the corresponding vertical time axes (ct in the upper pictures, and ct′ in the lower pictures). In the upper picture the place for W2 is taken to be Ax > 0, and thus the worldline (not shown in the pictures) of this clock intersects the worldline of the moving clock (the ct′-axis) in the event labelled A, where "two clocks are simultaneously at one place". In the lower picture the place for W'2 is taken to be Cx′ < 0, and so in this measurement the moving clock W passes W'2 in the event C.
In the upper picture the ct-coordinate At of the event A (the reading of W2) is labeled B, thus giving the elapsed time between the two events, measured with W1 and W2, as OB. For a comparison, the length of the time interval OA, measured with W', must be transformed to the scale of the ct-axis. This is done by the invariant hyperbola (see also Fig. 2-8) through A, connecting all events with the same spacetime interval from the origin as A. This yields the event C on the ct-axis, and obviously: OC < OB, the "moving" clock W' runs slower. In the lower picture the frame S is moving with velocity -v in the frame S' at rest. The worldline of W is the ct-axis, slanted to the left, the worldline of W'1 is the vertical ct′-axis and the worldline of W'2 is the vertical through event C, with ct′-coordinate D. The invariant parabola through event C scales the time interval OC to OA, which is shorter than OD; also, B is constructed (similar to D in the upper pictures) as simultaneous to A in S, at x = 0. The result OB > OC corresponds again to above. Please note the importance of the word "measure". In classical physics an observer cannot affect an observed object, but the objects state of motion can affect the observer's observations of the object. Many introductions to special relativity illustrate the differences between Galilean relativity and special relativity by posing a series of "paradoxes". These paradoxes are, in fact, ill-posed problems, resulting from our unfamiliarity with velocities comparable to the speed of light. The remedy is to solve many problems in special relativity and to become familiar with its so-called counter-intuitive predictions. The geometrical approach to studying spacetime is considered one of the best methods for developing a modern intuition. The twin paradox is a thought experiment involving identical twins, one of whom makes a journey into space in a high-speed rocket, returning home to find that the twin who remained on Earth has aged more. This result appears puzzling because each twin observes the other twin as moving, and so at first glance, it would appear that each should find the other to have aged less. The twin paradox sidesteps the justification for mutual time dilation presented above by avoiding the requirement for a third clock. :207 Nevertheless, the twin paradox is not a true paradox because it is easily understood within the context of special relativity. The impression that a paradox exists stems from a misunderstanding of what special relativity states. Special relativity does not declare all frames of reference to be equivalent, only inertial frames. The traveling twin's frame is not inertial during periods when she is accelerating. Furthermore, the difference between the twins is observationally detectable: the traveling twin needs to fire her rockets to be able to return home, while the stay-at-home twin does not. Deeper analysis is needed before we can understand why these distinctions should result in a difference in the twins' ages. Consider the spacetime diagram of Fig. 2‑11. This presents the simple case of a twin going straight out along the x axis and immediately turning back. From the standpoint of the stay-at-home twin, there is nothing puzzling about the twin paradox at all. The proper time measured along the traveling twin's world line from O to C, plus the proper time measured from C to B, is less than the stay-at-home twin's proper time measured from O to A to B. More complex trajectories require integrating the proper time between the respective events along the curve (i.e. the path integral) to calculate the total amount of proper time experienced by the traveling twin. Complications arise if the twin paradox is analyzed from the traveling twin's point of view. For the rest of this discussion, we adopt Weiss's nomenclature, designating the stay-at-home twin as Terence and the traveling twin as Stella. We had previously noted that Stella is not in an inertial frame. Given this fact, it is sometimes stated that full resolution of the twin paradox requires general relativity. This is not true. A pure SR analysis would be as follows: Analyzed in Stella's rest frame, she is motionless for the entire trip. When she fires her rockets for the turnaround, she experiences a pseudo force which resembles a gravitational force. Figs. 2‑6 and 2‑11 illustrate the concept of lines (planes) of simultaneity: Lines parallel to the observer's x-axis (xy-plane) represent sets of events that are simultaneous in the observer frame. In Fig. 2‑11, the blue lines connect events on Terence's world line which, from Stella's point of view, are simultaneous with events on her world line. (Terence, in turn, would observe a set of horizontal lines of simultaneity.) Throughout both the outbound and the inbound legs of Stella's journey, she measures Terence's clocks as running slower than her own. But during the turnaround (i.e. between the bold blue lines in the figure), a shift takes place in the angle of her lines of simultaneity, corresponding to a rapid skip-over of the events in Terence's world line that Stella considers to be simultaneous with her own. Therefore, at the end of her trip, Stella finds that Terence has aged more than she has. This introductory section has focused on the spacetime of special relativity, since it is the easiest to describe. Minkowski spacetime is flat, takes no account of gravity, is uniform throughout, and serves as nothing more than a static background for the events that take place in it. The presence of gravity greatly complicates the description of spacetime. In general relativity, spacetime is no longer a static background, but actively interacts with the physical systems that it contains. Spacetime curves in the presence of matter, can propagate waves, bends light, and exhibits a host of other phenomena. :221 A few of these phenomena are described in the later sections of this article. Fig. 3-1 illustrates that in Newton's theory, time is universal, not the velocity of light. :36–37 Consider the following thought experiment: The red arrow illustrates a train that is moving at 0.4 c with respect to the platform. Within the train, a passenger shoots a bullet with a speed of 0.4 c in the frame of the train. The blue arrow illustrates that a person standing on the train tracks measures the bullet as traveling at 0.8 c. This is in accordance with our naive expectations. which is the common-sense Galilean law for the addition of velocities. From the platform, the composite speed of the bullet is given by u = c(s + r)/(a + b). The two yellow triangles are similar because they are right triangles that share a common angle α. In the large yellow triangle, the ratio s/a = v/c = β. The ratios of corresponding sides of the two yellow triangles are constant, so that r/a = b/s = n/m = β′. So b = u′s/c and r = u′a/c. If u′ and v are both very small compared with the speed of light, then the product vu′/c2 becomes vanishingly small, and the overall result becomes indistinguishable from the Galilean formula (Newton's formula) for the addition of velocities: u = u′ + v. The Galilean formula is a special case of the relativistic formula applicable to low velocities. We had previously discussed, in qualitative terms, time dilation and length contraction. It is straightforward to obtain quantitative expressions for these effects. Fig. 3‑3 is a composite image containing individual frames taken from two previous animations, simplified and relabeled for the purposes of this section. becomes physically meaningless, implying that c is the maximum possible speed in nature. Next, we note that for any v greater than zero, the Lorentz factor will be greater than one, although the shape of the curve is such that for low speeds, the Lorentz factor is extremely close to one. The Galilean transformations and their consequent commonsense law of addition of velocities work well in our ordinary low-speed world of planes, cars and balls. Beginning in the mid-1800s, however, sensitive scientific instrumentation began finding anomalies that did not fit well with the ordinary addition of velocities. To transform the coordinates of an event from one frame to another in special relativity, we use the Lorentz transformations. When v ≪ c and x is small enough, the v2/c2 and vx/c2 terms approach zero, and the Lorentz transformations approximate to the Galilean transformations. and so forth. Although, for brevity, we write the Lorentz transformation equations without deltas, it should be understood that x means Δx, etc. We are, in general, always concerned with the space and time differences between events. (t − vx/c2) = 519.62 s as she passes the finish line, and she calculates the distance between the starting and finish lines, as measured in her frame, to be 259.81 light-seconds (about 7010779000000000000♠77.9×106 km). 1). There have been many dozens of derivations of the Lorentz transformations since Einstein's original work in 1905, each with its particular focus. Although Einstein's derivation was based on the invariance of the speed of light, there are other physical principles that may serve as starting points. Ultimately, these alternative starting points can be considered different expressions of the underlying principle of locality, which states that the influence that one particle exerts on another can not be transmitted instantaneously. It is easier at first to derive the inverse Lorentz transformation. From previous results using similar triangles, we know that s/a = b/r = v/c = β. Substituting equation (4) into s/a = β yields s = γw′β. The above equations are alternate expressions for the t and x equations of the inverse Lorentz transformation, as can be seen by substituting ct for w, ct′ for w′, and v/c for β. From the inverse transformation, the equations of the forwards transformation can be derived by solving for t′ and x′. A result of linearity is that if two Lorentz transformations are applied sequentially, the result is also a Lorentz transformation. Example: Terence observes Stella speeding away from him at 0.500 c, and he can use the Lorentz transformations with β = 0.500 to relate Stella's measurements to his own. Stella, in her frame, observes Ursula traveling away from her at 0.250 c, and she can use the Lorentz transformations with β = 0.250 to relate Ursula's measurements with her own. Because of the linearity of the transformations and the relativistic composition of velocities, Terence can use the Lorentz transformations with β = 0.666 to relate Ursula's measurements with his own. The Doppler effect is the change in frequency or wavelength of a wave for a receiver and source in relative motion. For simplicity, we consider here two basic scenarios: (1) The motions of the source and/or receiver are exactly along the line connecting them (longitudinal Doppler effect), and (2) the motions are at right angles to the said line (transverse Doppler effect). We are ignoring scenarios where they move along intermediate angles. Fig. 3-7b. What is the frequency measurement when the receiver sees the source as being closest to it? This scenario is most easily analyzed from the frame S of the receiver. Fig. 3-7c. If the receiver is moving in a circle around the source, what frequency does the receiver measure? Fig. 3-7d. If the source is moving in a circle around the receiver, what frequency does the receiver measure? In classical mechanics, the state of motion of a particle is characterized by its mass and its velocity. Linear momentum, the product of a particle's mass and velocity, is a vector quantity, possessing the same direction as the velocity: p = mv. It is a conserved quantity, meaning that if a closed system is not affected by external forces, its total linear momentum cannot change. In relativistic mechanics, the momentum vector is extended to four dimensions. Added to the momentum vector is a time component that allows the spacetime momentum vector to transform like the spacetime position vector (x, t). In exploring the properties of the spacetime momentum, we start, in Fig. 3‑8a, by examining what a particle looks like at rest. In the rest frame, the spatial component of the momentum is zero, i.e. p = 0, but the time component equals mc. We will use this information shortly to obtain an expression for the four-momentum. Light particles, or photons, travel at the speed of c, the constant that is conventionally known as the speed of light. This statement is not a tautology, since many modern formulations of relativity do not start with constant speed of light as a postulate. Photons therefore propagate along a light-like world line and, in appropriate units, have equal space and time components for every observer. A consequence of Maxwell's theory of electromagnetism is that light carries energy and momentum, and that their ratio is a constant: E/p = c. Rearranging, E/c = p, and since for photons, the space and time components are equal, E/c must therefore be equated with the time component of the spacetime momentum vector. Photons travel at the speed of light, yet have finite momentum and energy. For this to be so, the mass term in γmc must be zero, meaning that photons are massless particles. Infinity times zero is an ill-defined quantity, but E/c is well-defined. Consideration of the interrelationships between the various components of the relativistic momentum vector led Einstein to several famous conclusions. approaches 1, so the spatial component of the relativistic momentum βγmc = γmv approaches mv, the classical term for momentum. Following this perspective, γm can be interpreted as a relativistic generalization of m. Einstein proposed that the relativistic mass of an object increases with velocity according to the formula mrel = γm. Likewise, comparing the time component of the relativistic momentum with that of the photon, γmc = mrelc = E/c, so that Einstein arrived at the relationship E = mrelc2. Simplified to the case of zero velocity, this is Einstein's famous equation relating energy and mass. The concept of relativistic mass that Einstein introduced in 1905, mrel, although amply validated every day in particle accelerators around the globe (or indeed in any instrumentation whose use depends on high velocity particles, such as electron microscopes, old-fashioned color television sets, etc. ), has nevertheless not proven to be a fruitful concept in physics in the sense that it is not a concept that has served as a basis for other theoretical development. Relativistic mass, for instance, plays no role in general relativity. In physics, conservation laws state that certain particular measurable properties of an isolated physical system do not change as the system evolves over time. In 1915, Emmy Noether discovered that underlying each conservation law is a fundamental symmetry of nature. The fact that physical processes don't care where in space they take place (space translation symmetry) yields conservation of momentum, the fact that such processes don't care when they take place (time translation symmetry) yields conservation of energy, and so on. In this section, we examine the Newtonian views of conservation of mass, momentum and energy from a relativistic perspective. To understand how the Newtonian view of conservation of momentum needs to be modified in a relativistic context, we examine the problem of two colliding bodies limited to a single dimension. In Newtonian mechanics, two extreme cases of this problem may be distinguished yielding mathematics of minimum complexity: (1) The two bodies rebound from each other in a completely elastic collision. (2) The two bodies stick together and continue moving as a single particle. This second case is the case of completely inelastic collision. For both cases (1) and (2), momentum, mass, and total energy are conserved. However, kinetic energy is not conserved in cases of inelastic collision. A certain fraction of the initial kinetic energy is converted to heat. In case (2), two masses with momentums p1 = m1v1 and p2 = m2v2 collide to produce a single particle of conserved mass m = m1 + m2 traveling at the center of mass velocity of the original system, vcm = (m1v1 + m2v2)/(m1 + m2). The total momentum p = p1 + p2 is conserved. (right) Center of Momentum Frame. The freedom to choose any frame in which to perform an analysis allows us to pick one which may be particularly convenient. For analysis of momentum and energy problems, the most convenient frame is usually the "center-of-momentum frame" (also called the zero-momentum frame, or COM frame). This is the frame in which the space component of the system's total momentum is zero. Fig. 3‑11 illustrates the breakup of a high speed particle into two daughter particles. In the lab frame, the daughter particles are preferentially emitted in a direction oriented along the original particle's trajectory. In the COM frame, however, the two daughter particles are emitted in opposite directions, although their masses and the magnitude of their velocities are generally not the same. Figure 3-12a. Energy-momentum diagram for decay of a charged pion. Figure 3-12b. Graphing calculator analysis of charged pion decay. Example: Because of the equivalence of mass and energy, elementary particle masses are customarily stated in energy units, where 1 MeV = 1×106 electron volts. A charged pion is a particle of mass 139.57 MeV (approx. 273 times the electron mass). It is unstable, and decays into a muon of mass 105.66 MeV (approx. 207 times the electron mass) and an antineutrino, which has an almost negligible mass. The difference between the pion mass and the muon mass is 33.91 MeV. Fig. 3‑12a illustrates the energy-momentum diagram for this decay reaction in the rest frame of the pion. Because of its negligible mass, a neutrino travels at very nearly the speed of light. The relativistic expression for its energy, like that of the photon, is Eν = pc, which is also the value of the space component of its momentum. To conserve momentum, the muon has the same value of the space component of the neutrino's momentum, but in the opposite direction. Algebraic analyses of the energetics of this decay reaction are available online, so Fig. 3‑12b presents instead a graphing calculator solution. The energy of the neutrino is 29.79 MeV, and the energy of the muon is 33.91 − 29.79 = 4.12 MeV. Most of the energy is carried off by the near-zero-mass neutrino. The topics in this section are of significantly greater technical difficulty than those in the preceding sections and are not essential for understanding Introduction to curved spacetime. Figure 4-1a. A ray through the unit circle x2 + y2 = 1 in the point (cos a, sin a), where a is twice the area between the ray, the circle, and the x-axis. Figure 4-1b. A ray through the unit hyperbola x2 - y2 = 1 in the point (cosh a, sinh a), where a is twice the area between the ray, the hyperbola, and the x-axis. Figure 4-2. Plot of the three basic Hyperbolic functions: hyperbolic sine (sinh), hyperbolic cosine (cosh) and hyperbolic tangent (tanh). Sinh is red, cosh is blue and tanh is green. Lorentz transformations relate coordinates of events in one reference frame to those of another frame. Relativistic composition of velocities is used to add two velocities together. The formulas to perform the latter computations are nonlinear, making them more complex than the corresponding Galilean formulas. This nonlinearity is an artifact of our choice of parameters. :47–59 We have previously noted that in an x–ct spacetime diagram, the points at some constant spacetime interval from the origin form an invariant hyperbola. We have also noted that the coordinate systems of two spacetime reference frames in standard configuration are hyperbolically rotated with respect to each other. The natural functions for expressing these relationships are the hyperbolic analogs of the trigonometric functions. Fig. 4‑1a shows a unit circle with sin(a) and cos(a), the only difference between this diagram and the familiar unit circle of elementary trigonometry being that a is interpreted, not as the angle between the ray and the x-axis, but as twice the area of the sector swept out by the ray from the x-axis. (Numerically, the angle and 2 × area measures for the unit circle are identical.) Fig. 4‑1b shows a unit hyperbola with sinh(a) and cosh(a), where a is likewise interpreted as twice the tinted area. Fig. 4‑2 presents plots of the sinh, cosh, and tanh functions. Transformations describing relative motion with uniform velocity and without rotation of the space coordinate axes are called boosts. Four‑vectors have been mentioned above in context of the energy-momentum 4‑vector, but without any great emphasis. Indeed, none of the elementary derivations of special relativity require them. But once understood, 4‑vectors, and more generally tensors, greatly simplify the mathematics and conceptual understanding of special relativity. Working exclusively with such objects leads to formulas that are manifestly relativistically invariant, which is a considerable advantage in non-trivial contexts. For instance, demonstrating relativistic invariance of Maxwell's equations in their usual form is not trivial, while it is merely a routine calculation (really no more than an observation) using the field strength tensor formulation. On the other hand, general relativity, from the outset, relies heavily on 4‑vectors, and more generally tensors, representing physically relevant entities. Relating these via equations that do not rely on specific coordinates requires tensors, capable of connecting such 4‑vectors even within a curved spacetime, and not just within a flat one as in special relativity. The study of tensors is outside the scope of this article, which provides only a basic discussion of spacetime. A 4-tuple, A = (A0, A1, A2, A3) is a "4-vector" if its component A i transform between frames according to the Lorentz transformation. which comes from simply replacing ct with A0 and x with A1 in the earlier presentation of the Lorentz transformation. As usual, when we write x, t, etc. we generally mean Δx, Δt etc. Closure under linear combination: If A and B are 4-vectors, then C = aA + aB is also a 4-vector. In addition to being invariant under Lorentz transformation, the above inner product is also invariant under rotation in 3-space. Unlike the case with 3-vectors, orthogonal 4-vectors are not necessarily at right angles with each other. The rule is that two 4-vectors are orthogonal if they are offset by equal and opposite angles from the 45° line which is the world line of a light ray. This implies that a lightlike 4-vector is orthogonal with itself. Displacement 4-vector: Otherwise known as the spacetime separation, this is (Δt, Δx, Δy, Δz), or for infinitesimal separations, (dt, dx, dy, dz). is the proper time between the two events that yield dt, dx, dy, and dz. Figure 4-3a. The momentarily comoving reference frames of an accelerating particle as observed from a stationary frame. Figure 4-3b. The momentarily comoving reference frames along the trajectory of an accelerating observer (center). The 4-velocity is tangent to the world line of a particle, and has a length equal to one unit of time in the frame of the particle. An accelerated particle does not have an inertial frame in which it is always at rest. However, as stated before in the earlier discussion of the transverse Doppler effect, an inertial frame can always be found which is momentarily comoving with the particle. This frame, the momentarily comoving reference frame (MCRF), enables application of special relativity to the analysis of accelerated particles. for a photon, and a 4-velocity cannot be defined. There is no frame in which a photon is at rest, and no MCRF can be established along a photon's path. The first component is the total energy (including mass) of the particle (or system of particles) in a given frame, while the remaining components are its spatial momentum. The energy-momentum 4-vector is a conserved quantity. The first postulate of special relativity declares the equivalency of all inertial frames. A physical law holding in one frame must apply in all frames, since otherwise it would be possible to differentiate between frames. As noted in the previous discussion of energy and momentum conservation, Newtonian momenta fail to behave properly under Lorentzian transformation, and Einstein preferred to change the definition of momentum to one involving 4-vectors rather than give up on conservation of momentum. It is a common misconception that special relativity is applicable only to inertial frames, and that it is unable to handle accelerating objects or accelerating reference frames. Actually, accelerating objects can generally be analyzed without needing to deal with accelerating frames at all. It is only when gravitation is significant that general relativity is required. Properly handling accelerating frames does require some care, however. The difference between special and general relativity is that (1) In special relativity, all velocities are relative, but acceleration is absolute. (2) In general relativity, all motion is relative, whether inertial, accelerating, or rotating. To accommodate this difference, general relativity uses curved spacetime. In this section, we analyze several scenarios involving accelerated reference frames. The Dewan–Beran–Bell spaceship paradox (Bell's spaceship paradox) is a good example of a problem where intuitive reasoning unassisted by the geometric insight of the spacetime approach can lead to issues. In Fig. 4‑4, two identical spaceships float in space and are at rest relative to each other. They are connected by a string which is capable of only a limited amount of stretching before breaking. At a given instant in our frame, the observer frame, both spaceships accelerate in the same direction along the line between them with the same constant proper acceleration. [note 12] Will the string break? To observers in the rest frame, the spaceships start a distance L apart and remain the same distance apart during acceleration. 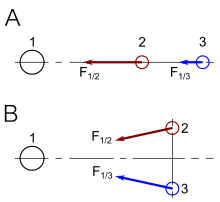 During acceleration, L is a length contracted distance of the distance L' = γL in the frame of the accelerating spaceships. After a sufficiently long time, γ will increase to a sufficiently large factor that the string must break. Figure 4-5. The blue lines represent the world lines of two observers A and B who accelerate in the same direction with the same constant magnitude acceleration. At A' and B', the observers stop accelerating. The dotted line is a line of simultaneity for either observer after acceleration stops. Certain special relativity problem setups can lead to insight about phenomena normally associated with general relativity, such as event horizons. In the text accompanying Fig. 2‑7, we had noted that the magenta hyperbolae represented actual paths that are tracked by a constantly accelerating traveler in spacetime. During periods of positive acceleration, the traveler's velocity just approaches the speed of light, while, measured in our frame, the traveler's acceleration constantly decreases. Figure 4-6. Accelerated relativistic observer with horizon. Another well-drawn illustration of the same topic may be viewed here. Two central propositions underlie general relativity. The equivalence principle states that in any sufficiently small region of space, the effects of gravitation are the same as those from acceleration. To go from the elementary description above of curved spacetime to a complete description of gravitation requires tensor calculus and differential geometry, topics both requiring considerable study. Without these mathematical tools, it is possible to write about general relativity, but it is not possible to demonstrate any non-trivial derivations. Rather than this section attempting to offer a (yet another) relatively non-mathematical presentation about general relativity, the reader is referred to the featured Wikipedia articles Introduction to general relativity and General relativity. Instead, the focus in this section will be to explore a handful of elementary scenarios that serve to give somewhat of the flavor of general relativity. A photon climbing in Earth's gravitational field loses energy and is redshifted. Early attempts to measure this redshift through astronomical observations were somewhat inconclusive, but definitive laboratory observations were performed by Pound & Rebka (1959) and later by Pound & Snider (1964). Light has an associated frequency, and this frequency may be used to drive the workings of a clock. The gravitational redshift leads to an important conclusion about time itself: Gravity makes time run slower. Suppose we build two identical clocks whose rates are controlled by some stable atomic transition. Place one clock on top of the tower, while the other clock remains on the ground. An experimenter on top of the tower observes that signals from the ground clock are lower in frequency than those of the clock next to her on the tower. Light going up the tower is just a wave, and it is impossible for wave crests to disappear on the way up. Exactly as many oscillations of light arrive at the top of the tower as were emitted at the bottom. The experimenter concludes that the ground clock is running slow, and can confirm this by bringing the tower clock down to compare side-by-side with the ground clock. :16–18 For a 1 km tower, the discrepancy would amount to about 9.4 nanoseconds per day, easily measurable with modern instrumentation. in the denominator, the correction factor increases as one approaches the gravitating body, meaning that time is curved. But general relativity is a theory of curved space and curved time, so if there are terms modifying the spatial components of the spacetime interval presented above, shouldn't their effects be seen on, say, planetary and satellite orbits due to curvature correction factors applied to the spatial terms? Despite the minuteness of the spatial terms, the first indications that something was wrong with Newtonian gravitation were discovered over a century-and-a-half ago. In 1859, Urbain Le Verrier, in an analysis of available timed observations of transits of Mercury over the Sun's disk from 1697 to 1848, reported that known physics could not explain the orbit of Mercury, unless there possibly existed a planet or asteroid belt within the orbit of Mercury. The perihelion of Mercury's orbit exhibited an excess rate of precession over that which could be explained by the tugs of the other planets. The ability to detect and accurately measure the minute value of this anomalous precession (only 43 arc seconds per tropical century) is testimony to the sophistication of 19th century astrometry. Figure 5-4. General relativity is a theory of curved time and curved space. Click here to animate. As the famous astronomer who had earlier discovered the existence of Neptune "at the tip of his pen" by analyzing wobbles in the orbit of Uranus, Le Verrier's announcement triggered a two-decades long period of "Vulcan-mania", as professional and amateur astronomers alike hunted for the hypothetical new planet. This search included several false sightings of Vulcan. It was ultimately established that no such planet or asteroid belt existed. In 1916, Einstein was to show that this anomalous precession of Mercury is explained by the spatial terms in the curvature of spacetime. Curvature in the temporal term, being simply an expression of Newtonian gravitation, has no part in explaining this anomalous precession. The success of his calculation was a powerful indication to Einstein's peers that the general theory of relativity could be correct. The story of the 1919 Eddington eclipse expedition and Einstein's rise to fame is well told elsewhere. In Newton's theory of gravitation, the only source of gravitational force is mass. (red): The total mass-energy density, including any contributions to the potential energy from forces between the particles, as well as kinetic energy from random thermal motions. (orange): These are momentum density terms. Even if there is no bulk motion, energy may be transmitted by heat conduction, and the conducted energy will carry momentum. are the rates of flow of the i-component of momentum per unit area in the j-direction. Even if there is no bulk motion, random thermal motions of the particles will give rise to momentum flow, so the i = j terms (green) represent isotropic pressure, and the i ≠ j terms (blue) represent shear stresses. One important conclusion to be derived from the equations is that, colloquially speaking, gravity itself creates gravity. [note 14] Energy has mass. Even in Newtonian gravity, the gravitational field is associated with an energy, E = mgh, called the gravitational potential energy. In general relativity, the energy of the gravitational field feeds back into creation of the gravitational field. This makes the equations nonlinear and hard to solve in anything other than weak field cases. :240 Numerical relativity is a branch of general relativity using numerical methods to solve and analyze problems, often employing supercomputers to study black holes, gravitational waves, neutron stars and other phenomena in the strong field regime. Figure 5-6. (left) Mass-energy warps spacetime. (right) Rotating mass-energy distributions with angular momentum J generate gravitomagnetic fields H.
In special relativity, mass-energy is closely connected to momentum. As we have discussed earlier in the section on Energy and momentum, just as space and time are different aspects of a more comprehensive entity called spacetime, mass-energy and momentum are merely different aspects of a unified, four-dimensional quantity called four-momentum. In consequence, if mass-energy is a source of gravity, momentum must also be a source. The inclusion of momentum as a source of gravity leads to the prediction that moving or rotating masses can generate fields analogous to the magnetic fields generated by moving charges, a phenomenon known as gravitomagnetism. It is well known that the force of magnetism can be deduced by applying the rules of special relativity to moving charges. (An eloquent demonstration of this was presented by Feynman in volume II, chapter 13–6 of his Lectures on Physics, available online.) Analogous logic can be used to demonstrate the origin of gravitomagnetism. In Fig. 5‑7a, two parallel, infinitely long streams of massive particles have equal and opposite velocities −v and +v relative to a test particle at rest and centered between the two. Because of the symmetry of the setup, the net force on the central particle is zero. Assume v << c so that velocities are simply additive. Fig. 5‑7b shows exactly the same setup, but in the frame of the upper stream. The test particle has a velocity of +v, and the bottom stream has a velocity of +2v. Since the physical situation has not changed, only the frame in which things are observed, the test particle should not be attracted towards either stream. But it is not at all clear that the forces exerted on the test particle are equal. (1) Since the bottom stream is moving faster than the top, each particle in the bottom stream has a larger mass energy than a particle in the top. (2) Because of Lorentz contraction, there are more particles per unit length in the bottom stream than in the top stream. (3) Another contribution to the active gravitational mass of the bottom stream comes from an additional pressure term which, at this point, we do not have sufficient background to discuss. All of these effects together would seemingly demand that the test particle be drawn towards the bottom stream. Matter in motion through a gravitomagnetic field is hence subject to so-called frame-dragging effects analogous to electromagnetic induction. It has been proposed that such gravitomagnetic forces underlie the generation of the relativistic jets (Fig. 5‑8) ejected by some rotating supermassive black holes. Quantities that are directly related to energy and momentum should be sources of gravity as well, namely internal pressure and stress. Taken together, mass-energy, momentum, pressure and stress all serve as sources of gravity: Collectively, they are what tells spacetime how to curve. The stress terms become highly significant when performing calculations such as hydrodynamic simulations of core-collapse supernovae. These predictions for the roles of pressure, momentum and stress as sources of spacetime curvature are elegant and play an important role in theory. In regards to pressure, the early universe was radiation dominated, and it is highly unlikely that any of the relevant cosmological data (e.g. nucleosynthesis abundances, etc.) could be reproduced if pressure did not contribute to gravity, or if it did not have the same strength as a source of gravity as mass-energy. Likewise, the mathematical consistency of the Einstein field equations would be broken if the stress terms didn't contribute as a source of gravity. All that is well and good, but are there any direct, quantitative experimental or observational measurements that confirm that these terms contribute to gravity with the correct strength?
) is the mass which reacts to acceleration.
) in our discussion of the equivalence principle in the Basic propositions section. are equal is an empirical result. is dictated by the equivalence principle. The classic experiment to measure the strength of a gravitational source (i.e. its active mass) was first conducted in 1797 by Henry Cavendish (Fig. 5‑9a). Two small but dense balls are suspended on a fine wire, making a torsion balance. Bringing two large test masses close to the balls introduces a detectable torque. Given the dimensions of the apparatus and the measurable spring constant of the torsion wire, the gravitational constant G can be determined. To study pressure effects by compressing the test masses is hopeless, because attainable laboratory pressures are insignificant in comparison with the mass-energy of a metal ball. However, the repulsive electromagnetic pressures resulting from protons being tightly squeezed inside atomic nuclei are typically on the order of 1028 atm ≈ 1033 Pa ≈ 1033 kg·s−2m−1. This amounts to about 1% of the nuclear mass density of approximately 1018kg/m3 (after factoring in c2 ≈ 9×1016m2s−2). Figure 5-10. Lunar laser ranging experiment. (left) This retroreflector was left on the Moon by astronauts on the Apollo 11 mission. (right) Astronomers all over the world have bounced laser light off the retroreflectors left by Apollo astronauts and Russian lunar rovers to measure precisely the Earth-Moon distance. should be lower for nuclei with higher atomic number Z, in which the electrostatic pressures are higher. L. B. Kreuzer (1968) did a Cavendish experiment using a Teflon mass suspended in a mixture of the liquids trichloroethylene and dibromoethane having the same buoyant density as the Teflon (Fig. 5‑9b). Fluorine has atomic number Z = 9, while bromine has Z = 35. Kreuzer found that repositioning the Teflon mass caused no differential deflection of the torsion bar, hence establishing active mass and passive mass to be equivalent to a precision of 5×10−5. Although Kreuzer originally considered this experiment merely to be a test of the ratio of active mass to passive mass, Clifford Will (1976) reinterpreted the experiment as a fundamental test of the coupling of sources to gravitational fields. In 1986, Bartlett and Van Buren noted that lunar laser ranging had detected a 2-km offset between the moon's center of figure and its center of mass. This indicates an asymmetry in the distribution of Fe (abundant in the Moon's core) and Al (abundant in its crust and mantle). If pressure did not contribute equally to spacetime curvature as does mass-energy, the moon would not be in the orbit predicted by classical mechanics. They used their measurements to tighten the limits on any discrepancies between active and passive mass to about 1×10−12. The existence of gravitomagnetism was proven by Gravity Probe B (GP-B), a satellite-based mission which launched on 20 April 2004. The spaceflight phase lasted until 2005 . The mission aim was to measure spacetime curvature near Earth, with particular emphasis on gravitomagnetism. Initial results confirmed the relatively large geodetic effect (which is due to simple spacetime curvature, and is also known as de Sitter precession) to an accuracy of about 1%. The much smaller frame-dragging effect (which is due to gravitomagnetism, and is also known as Lense–Thirring precession) was difficult to measure because of unexpected charge effects causing variable drift in the gyroscopes. Nevertheless, by August 2008 , the frame-dragging effect had been confirmed to within 15% of the expected result, while the geodetic effect was confirmed to better than 0.5%. 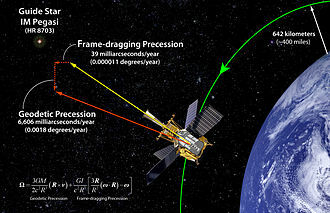 Subsequent measurements of frame dragging by laser-ranging observations of the LARES, LAGEOS-1 and LAGEOS-2 satellites has improved on the GP-B measurement, with results (as of 2016) demonstrating the effect to within 5% of its theoretical value, although there has been some disagreement on the accuracy of this result. Another effort, the Gyroscopes in General Relativity (GINGER) experiment, seeks to use three 6 m ring lasers mounted at right angles to each other 1400 m below the Earth's surface to measure this effect. In Poincaré's conventionalist views, the essential criteria according to which one should select a Euclidean versus non-Euclidean geometry would be economy and simplicity. A realist would say that Einstein discovered spacetime to be non-Euclidean. A conventionalist would say that Einstein merely found it more convenient to use non-Euclidean geometry. The conventionalist would maintain that Einstein's analysis said nothing about what the geometry of spacetime really is. 1. Is it possible to represent general relativity in terms of flat spacetime? 2. Are there any situations where a flat spacetime interpretation of general relativity may be more convenient than the usual curved spacetime interpretation? Riemannian geometry is the branch of differential geometry that studies Riemannian manifolds, smooth manifolds with a Riemannian metric, i.e. with an inner product on the tangent space at each point that varies smoothly from point to point. This gives, in particular, local notions of angle, length of curves, surface area and volume. From those, some other global quantities can be derived by integrating local contributions. Riemannian geometry originated with the vision of Bernhard Riemann expressed in his inaugural lecture "Ueber die Hypothesen, welche der Geometrie zu Grunde liegen" ("On the Hypotheses on which Geometry is Based"). It is a very broad and abstract generalization of the differential geometry of surfaces in R3. Development of Riemannian geometry resulted in synthesis of diverse results concerning the geometry of surfaces and the behavior of geodesics on them, with techniques that can be applied to the study of differentiable manifolds of higher dimensions. It enabled the formulation of Einstein's general theory of relativity, made profound impact on group theory and representation theory, as well as analysis, and spurred the development of algebraic and differential topology. (representing another observer), the intersection of the charts represents the region of spacetime in which both observers can measure physical quantities and hence compare results. The relation between the two sets of measurements is given by a non-singular coordinate transformation on this intersection. The idea of coordinate charts as local observers who can perform measurements in their vicinity also makes good physical sense, as this is how one actually collects physical data—locally. (as they are using different coordinate systems). Although their kinematic descriptions will differ, dynamical (physical) laws, such as momentum conservation and the first law of thermodynamics, will still hold. In fact, relativity theory requires more than this in the sense that it stipulates these (and all other physical) laws must take the same form in all coordinate systems. This introduces tensors into relativity, by which all physical quantities are represented. Geodesics are said to be time-like, null, or space-like if the tangent vector to one point of the geodesic is of this nature. Paths of particles and light beams in spacetime are represented by time-like and null (light-like) geodesics, respectively. ^ By stating that simultaneity is a matter of convention, Poincaré meant that to talk about time at all, one must have synchronized clocks, and the synchronization of clocks must be established by a specified, operational procedure (convention). This stance represented a fundamental philosophical break from Newton, who conceived of an absolute, true time that was independent of the workings of the inaccurate clocks of his day. This stance also represented a direct attack against the influential philosopher Henri Bergson, who argued that time, simultaneity, and duration were matters of intuitive understanding. ^ The operational procedure adopted by Poincaré was essentially identical to what is known as Einstein synchronization, even though a variant of it was already a widely used procedure by telegraphers in the middle 19th century. Basically, to synchronize two clocks, one flashes a light signal from one to the other, and adjusts for the time that the flash takes to arrive. ^ In the original version of this lecture, Minkowski continued to use such obsolescent terms as the ether, but the posthumous publication in 1915 of this lecture in the Annals of Physics (Annalen der Physik) was edited by Sommerfeld to remove this term. Sommerfeld also edited the published form of this lecture to revise Minkowski's judgement of Einstein from being a mere clarifier of the principle of relativity, to being its chief expositor. ^ (In the following, the group G∞ is the Galilean group and the group Gc the Lorentz group.) "With respect to this it is clear that the group Gc in the limit for c = ∞, i.e. as group G∞, exactly becomes the full group belonging to Newtonian Mechanics. In this state of affairs, and since Gc is mathematically more intelligible than G∞, a mathematician may, by a free play of imagination, hit upon the thought that natural phenomena actually possess an invariance, not for the group G∞, but rather for a group Gc, where c is definitely finite, and only exceedingly large using the ordinary measuring units." ^ In a Cartesian plane, ordinary rotation leaves a circle unchanged. In spacetime, hyperbolic rotation preserves the hyperbolic metric. ^ The ease of analyzing a relativistic scenario often depends on the frame in which one chooses to perform the analysis. In this linked image, we present alternative views of the transverse Doppler shift scenario where source and receiver are at their closest approach to each other. (a) If we analyze the scenario in the frame of the receiver, we find that the analysis is more complicated than it should be. The apparent position of a celestial object is displaced from its true position (or geometric position) because of the object's motion during the time it takes its light to reach an observer. The source would be time-dilated relative to the receiver, but the redshift implied by this time dilation would be offset by a blueshift due to the longitudinal component of the relative motion between the receiver and the apparent position of the source. (b) It is much easier if, instead, we analyze the scenario from the frame of the source. An observer situated at the source knows, from the problem statement, that the receiver is at its closest point to him. That means that the receiver has no longitudinal component of motion to complicate the analysis. Since the receiver's clocks are time-dilated relative to the source, the light that the receiver receives is therefore blue-shifted by a factor of gamma. ^ Not all experiments characterize the effect in terms of a redshift. For example, the Kündig experiment was set up to measure transverse blueshift using a Mössbauer source setup at the center of a centrifuge rotor and an absorber at the rim. ^ Rapidity arises naturally as a coordinates on the pure boost generators inside the Lie algebra algebra of the Lorentz group. Likewise, rotation angles arise naturally as coordinates (modulo 2π) on the pure rotation generators in the Lie algebra. (Together they coordinatize the whole Lie algebra.) A notable difference is that the resulting rotations are periodic in the rotation angle, while the resulting boosts are not periodic in rapidity (but rather one-to-one). The similarity between boosts and rotations is formal resemblance. ^ In relativity theory, proper acceleration is the physical acceleration (i.e., measurable acceleration as by an accelerometer) experienced by an object. It is thus acceleration relative to a free-fall, or inertial, observer who is momentarily at rest relative to the object being measured. ^ Newton himself was acutely aware of the inherent difficulties with these assumptions, but as a practical matter, making these assumptions was the only way that he could make progress. In 1692, he wrote to his friend Richard Bentley: "That Gravity should be innate, inherent and essential to Matter, so that one body may act upon another at a distance thro' a Vacuum, without the Mediation of any thing else, by and through which their Action and Force may be conveyed from one to another, is to me so great an Absurdity that I believe no Man who has in philosophical Matters a competent Faculty of thinking can ever fall into it." ^ Different reporters viewing the scenarios presented in this figure interpret the scenarios differently depending on their knowledge of the situation. (i) A first reporter, at the center of mass of particles 2 and 3 but unaware of the large mass 1, concludes that a force of repulsion exists between the particles in scenario A while a force of attraction exists between the particles in scenario B. (ii) A second reporter, aware of the large mass 1, smiles at the first reporter's naiveté. This second reporter knows that in reality, the apparent forces between particles 2 and 3 really represent tidal effects resulting from their differential attraction by mass 1. (iii) A third reporter, trained in general relativity, knows that there are, in fact, no forces at all acting between the three objects. Rather, all three objects move along geodesics in spacetime. ^ Relativistic jets are beams of ionised matter accelerated close to the speed of light. Most have been observationally associated with central black holes of some active galaxies, radio galaxies or quasars, as well as stellar black holes, neutron stars and pulsars. Beam lengths may extend from several thousand to millions of parsecs. ^ Rynasiewicz, Robert. "Newton's Views on Space, Time, and Motion". Stanford Encyclopedia of Philosophy. Metaphysics Research Lab, Stanford University. Retrieved 24 March 2017. ^ Davis, Philip J. (2006). Mathematics & Common Sense: A Case of Creative Tension. Wellesley, Massachusetts: A.K. Peters. p. 86. ISBN 9781439864326. ^ a b c d e Collier, Peter (2017). A Most Incomprehensible Thing: Notes Towards a Very Gentle Introduction to the Mathematics of Relativity (3rd ed.). Incomprehensible Books. ISBN 9780957389465. ^ Rowland, Todd. "Manifold". Wolfram Mathworld. Wolfram Research. Retrieved 24 March 2017. ^ a b French, A.P. (1968). Special Relativity. Boca Raton, Florida: CRC Press. pp. 35–60. ISBN 0748764224. ^ a b c d e f g Taylor, Edwin F.; Wheeler, John Archibald (1966). Spacetime Physics: Introduction to Special Relativity (1st ed.). San Francisco: Freeman. ISBN 071670336X. Retrieved 14 April 2017. ^ Scherr, Rachel E.; Shaffer, Peter S.; Vokos, Stamatis (July 2001). "Student understanding of time in special relativity: Simultaneity and reference frames" (PDF). American Journal of Physics. 69 (S1): S24–S35. arXiv:physics/0207109. Bibcode:2001AmJPh..69S..24S. doi:10.1119/1.1371254. Retrieved 11 April 2017. ^ Hughes, Stefan (2013). Catchers of the Light: Catching Space: Origins, Lunar, Solar, Solar System and Deep Space. Paphos, Cyprus: ArtDeCiel Publishing. pp. 202–233. ISBN 9781467579926. ^ Stachel, John (2005). "Fresnel's (Dragging) Coefficient as a Challenge to 19th Century Optics of Moving Bodies.". In Kox, A. J.; Eisenstaedt, Jean. The Universe of General Relativity (PDF). Boston: Birkhäuser. pp. 1–13. ISBN 081764380X. Archived from the original (PDF) on 13 April 2017. ^ a b c d e Pais, Abraham (1982). ""Subtle is the Lord-- ": The Science and the Life of Albert Einstein (11th ed.). Oxford: Oxford University Press. ISBN 019853907X. ^ Born, Max (1956). Physics in My Generation. London & New York: Pergamon Press. p. 194. Retrieved 10 July 2017. ^ a b c Miller, Arthur I. (1998). Albert Einstein's Special Theory of Relativity. New York: Springer-Verlag. ISBN 0387948708. ^ a b c Galison, Peter (2003). Einstein's Clocks, Poincaré's Maps: Empires of Time. New York: W. W. Norton & Company, Inc. pp. 13–47. ISBN 0393020010. ^ Poincare, Henri (1906). "On the Dynamics of the Electron (Sur la dynamique de l'électron)". Rendiconti del Circolo matematico di Palermo. 21: 129–176. Bibcode:1906RCMP...21..129P. doi:10.1007/bf03013466. Retrieved 15 July 2017. ^ a b Walter, Scott A. (2007). "Breaking in the 4-vectors: the four-dimensional movement in gravitation, 1905–1910". In Renn, Jürgen; Schemmel, Matthias. The Genesis of General Relativity, Volume 3. Berlin: Springer. pp. 193–252. Archived from the original on 15 July 2017. Retrieved 15 July 2017. ^ Einstein, Albert (1905). "On the Electrodynamics of Moving Bodies ( Zur Elektrodynamik bewegter Körper)". Annalen der Physik. 322 (10): 891–921. Bibcode:1905AnP...322..891E. doi:10.1002/andp.19053221004. Retrieved 7 April 2018. ^ Isaacson, Walter (2007). Einstein: His Life and Universe. Simon & Schuster. ISBN 978-0-7432-6473-0. ^ a b c d e f g h i j k l m n o p q r s t Schutz, Bernard (2004). Gravity from the Ground Up: An Introductory Guide to Gravity and General Relativity (Reprint ed.). Cambridge: Cambridge University Press. ISBN 0521455065. Retrieved 24 May 2017. ^ a b Weinstein, Galina (2012). "Max Born, Albert Einstein and Hermann Minkowski's Space-Time Formalism of Special Relativity". arXiv:1210.6929 [physics.hist-ph]. ^ Galison, Peter Louis (1979). "Minkowski's space-time: From visual thinking to the absolute world". Historical Studies in the Physical Sciences. 10: 85–121. doi:10.2307/27757388. JSTOR 27757388. ^ a b Minkowski, Hermann (1909). "Raum und Zeit" [Space and Time]. Jahresbericht der Deutschen Mathematiker-Vereinigung. B.G. Teubner: 1–14. ^ Kastrup, H. A. (2008). "On the advancements of conformal transformations and their associated symmetries in geometry and theoretical physics". Annalen der Physik. 520 (9–10): 631–690. arXiv:0808.2730. Bibcode:2008AnP...520..631K. doi:10.1002/andp.200810324. ^ Ratcliffe, J. G. (1994). "Hyperbolic geometry". Foundations of Hyperbolic Manifolds. New York. pp. 56–104. ISBN 038794348X. ^ Curtis, W. D.; Miller, F. R. (1985). Differential Manifolds and Theoretical Physics. Academic Press. p. 223. ISBN 978-0-08-087435-7. ^ Curiel, Erik; Bokulich, Peter. "Lightcones and Causal Structure". Stanford Encyclopedia of Philosophy. Metaphysics Research Lab, Stanford University. Retrieved 26 March 2017. ^ Savitt, Steven. "Being and Becoming in Modern Physics. 3. The Special Theory of Relativity". The Stanford Encyclopedia of Philosophy. Metaphysics Research Lab, Stanford University. Retrieved 26 March 2017. ^ a b c d e f Schutz, Bernard F. (1985). A first course in general relativity. Cambridge, UK: Cambridge University Press. p. 26. ISBN 0521277035. ^ a b c d e f g Weiss, Michael. "The Twin Paradox". The Physics and Relativity FAQ. Retrieved 10 April 2017. ^ Mould, Richard A. (1994). Basic Relativity (1st ed.). Springer. p. 42. ISBN 9780387952109. Retrieved 22 April 2017. ^ Lerner, Lawrence S. (1997). Physics for Scientists and Engineers, Volume 2 (1st ed.). Jones & Bartlett Pub. p. 1047. ISBN 9780763704605. Retrieved 22 April 2017. ^ a b c d e f g h i j k l m n o Bais, Sander (2007). Very Special Relativity: An Illustrated Guide. Cambridge, Massachusetts: Harvard University Press. ISBN 067402611X. ^ Forshaw, Jeffrey; Smith, Gavin (2014). Dynamics and Relativity. John Wiley & Sons. p. 118. ISBN 9781118933299. Retrieved 24 April 2017. ^ a b c d e f g h i j k l m n o p q Morin, David (2017). Special Relativity for the Enthusiastic Beginner. CreateSpace Independent Publishing Platform. ISBN 9781542323512. ^ Landau, L. D.; Lifshitz, E. M. (2006). The Classical Theory of Fields, Course of Theoretical Physics, Volume 2 (4th ed.). Amsterdam: Elsevier. pp. 1–24. ISBN 9780750627689. ^ a b Morin, David (2008). Introduction to Classical Mechanics: With Problems and Solutions. Cambridge University Press. ISBN 978-0-521-87622-3. ^ Griffiths, David J. (2013). Revolutions in Twentieth-Century Physics. Cambridge: Cambridge University Press. p. 60. ISBN 9781107602175. Retrieved 24 May 2017. ^ Byers, Nina (1998). "E. Noether's Discovery of the Deep Connection Between Symmetries and Conservation Laws". arXiv:physics/9807044. ^ Nave, R. "Energetics of Charged Pion Decay". Hyperphysics. Department of Physics and Astronomy, Georgia State University. Retrieved 27 May 2017. ^ Thomas, George B.; Weir, Maurice D.; Hass, Joel; Giordano, Frank R. (2008). Thomas' Calculus: Early Transcendentals (Eleventh ed.). Boston: Pearson Education, Inc. p. 533. ISBN 0321495756. ^ Taylor, Edwin F.; Wheeler, John Archibald (1992). Spacetime Physics (2nd ed.). W. H. Freeman. ISBN 0716723271. ^ a b Gibbs, Philip. "Can Special Relativity Handle Acceleration?". The Physics and Relativity FAQ. math.ucr.edu. Retrieved 28 May 2017. ^ Franklin, Jerrold (2010). "Lorentz contraction, Bell's spaceships, and rigid body motion in special relativity". European Journal of Physics. 31 (2): 291–298. arXiv:0906.1919. Bibcode:2010EJPh...31..291F. doi:10.1088/0143-0807/31/2/006. ^ Lorentz, H. A.; Einstein, A.; Minkowski, H.; Weyl, H. (1952). The Principle of Relativity: A Collection of Original Memoirs on the Special and General Theory of Relativity. Dover Publications. ISBN 0486600815. ^ a b c Mook, Delo E.; Vargish, Thoma s (1987). Inside Relativity. Princeton, New Jersey: Princeton University Press. ISBN 0691084726. ^ Mester, John. "Experimental Tests of General Relativity" (PDF). Laboratoire Univers et Théories. Archived from the original (PDF) on 9 June 2017. Retrieved 9 June 2017. ^ a b Carroll, Sean M. (2 December 1997). "Lecture Notes on General Relativity". arXiv:gr-qc/9712019. ^ Le Verrier, Urbain (1859). "Lettre de M. Le Verrier à M. Faye sur la théorie de Mercure et sur le mouvement du périhélie de cette planète". Comptes rendus hebdomadaires des séances de l'Académie des Sciences. 49: 379–383. ^ Worrall, Simon. "The Hunt for Vulcan, the Planet That Wasn't There". National Geographic. National Geographic. Retrieved 12 June 2017. ^ Levine, Alaina G. "May 29, 1919: Eddington Observes Solar Eclipse to Test General Relativity". APS News: This Month in Physics History. American Physical Society. Retrieved 12 June 2017. ^ Hobson, M. P.; Efstathiou, G.; Lasenby, A. N. (2006). General Relativity. Cambridge: Cambridge University Press. pp. 176–179. ISBN 9780521829519. ^ Thorne, Kip S. (1988). Fairbank, J. D.; Deaver Jr., B. S.; Everitt, W. F.; Michelson, P. F., eds. Near zero: New Frontiers of Physics (PDF). W. H. Freeman and Company. pp. 573–586. Archived from the original (PDF) on 30 June 2017. ^ Feynman, R. P.; Leighton, R. B.; Sands, M. (1964). The Feynman Lectures on Physics, vol. 2 (New Millenium ed.). Basic Books. pp. 13–6 to 13–11. ISBN 9780465024162. Retrieved 1 July 2017. ^ Williams, R. K. (1995). "Extracting X rays, Ύ rays, and relativistic e−–e+ pairs from supermassive Kerr black holes using the Penrose mechanism". Physical Review D. 51 (10): 5387–5427. Bibcode:1995PhRvD..51.5387W. doi:10.1103/PhysRevD.51.5387. PMID 10018300. ^ Williams, R. K. (2004). "Collimated escaping vortical polar e−–e+ jets intrinsically produced by rotating black holes and Penrose processes". The Astrophysical Journal. 611 (2): 952–963. arXiv:astro-ph/0404135. Bibcode:2004ApJ...611..952W. doi:10.1086/422304. ^ Kuroda, Takami; Kotake, Kei; Takiwaki, Tomoya (2012). "Fully General Relativistic Simulations of Core-Collapse Supernovae with An Approximate Neutrino Transport". The Astrophysical Journal. 755: 11. arXiv:1202.2487. Bibcode:2012ApJ...755...11K. doi:10.1088/0004-637X/755/1/11. ^ Wollack, Edward J. (10 December 2010). "Cosmology: The Study of the Universe". Universe 101: Big Bang Theory. NASA. Archived from the original on 14 May 2011. Retrieved 15 April 2017. ^ a b Bondi, Hermann (1957). DeWitt, Cecile M.; Rickles, Dean, eds. The Role of Gravitation in Physics: Report from the 1957 Chapel Hill Conference. Berlin: Max Planck Research Library. pp. 159–162. ISBN 9783869319636. Retrieved 1 July 2017. ^ Crowell, Benjamin (2000). General Relativity. Fullerton, CA: Light and Matter. pp. 241–258. Retrieved 30 June 2017. ^ Kreuzer, L. B. (1968). "Experimental measurement of the equivalence of active and passive gravitational mass". Physical Review. 169 (5): 1007–1011. Bibcode:1968PhRv..169.1007K. doi:10.1103/PhysRev.169.1007. ^ Will, C. M. (1976). "Active mass in relativistic gravity-Theoretical interpretation of the Kreuzer experiment". The Astrophysical Journal. 204: 224–234. Bibcode:1976ApJ...204..224W. doi:10.1086/154164. ^ Bartlett, D. F.; Van Buren, Dave (1986). "Equivalence of active and passive gravitational mass using the moon". Phys. Rev. Lett. 57 (1): 21–24. Bibcode:1986PhRvL..57...21B. doi:10.1103/PhysRevLett.57.21. PMID 10033347. Retrieved 1 July 2017. ^ "Gravity Probe B: FAQ". Retrieved 2 July 2017. ^ Gugliotta, G. (16 February 2009). "Perseverance Is Paying Off for a Test of Relativity in Space". New York Times. Retrieved 2 July 2017. ^ Everitt, C.W.F. ; Parkinson, B.W. (2009). "Gravity Probe B Science Results—NASA Final Report" (PDF). Retrieved 2 July 2017. ^ Everitt; et al. (2011). "Gravity Probe B: Final Results of a Space Experiment to Test General Relativity". Physical Review Letters. 106 (22): 221101. arXiv:1105.3456. Bibcode:2011PhRvL.106v1101E. doi:10.1103/PhysRevLett.106.221101. PMID 21702590. ^ Ciufolini, Ignazio; Paolozzi, Antonio Rolf Koenig; Pavlis, Erricos C.; Koenig, Rolf (2016). "A test of general relativity using the LARES and LAGEOS satellites and a GRACE Earth gravity model". Eur Phys J C. 76 (3): 120. arXiv:1603.09674. Bibcode:2016EPJC...76..120C. doi:10.1140/epjc/s10052-016-3961-8. PMC 4946852. PMID 27471430. ^ Iorio, L. (February 2017). "A comment on "A test of general relativity using the LARES and LAGEOS satellites and a GRACE Earth gravity model. Measurement of Earth's dragging of inertial frames," by I. Ciufolini et al". The European Physical Journal C. 77 (2): 73. arXiv:1701.06474. Bibcode:2017EPJC...77...73I. doi:10.1140/epjc/s10052-017-4607-1. ^ Cartlidge, Edwin. "Underground ring lasers will put general relativity to the test". physicsworld.com. Institute of Physics. Retrieved 2 July 2017. ^ "Einstein right using the most sensitive Earth rotation sensors ever made". Phys.org. Science X network. Retrieved 2 July 2017. ^ Murzi, Mauro. "Jules Henri Poincaré (1854–1912)". Internet Encyclopedia of Philosophy (ISSN 2161-0002). Retrieved 9 April 2018. ^ Deser, S. (1970). "Self-Interaction and Gauge Invariance" (PDF). General Relativity and Gravitation. 1 (18): 9–8. arXiv:gr-qc/0411023. Bibcode:1970GReGr...1....9D. doi:10.1007/BF00759198. Retrieved 9 April 2018. ^ Grishchuk, L. P.; Petrov, A. N.; Popova, A. D. (1984). "Exact Theory of the (Einstein) Gravitational Field in an Arbitrary Background Space-Time". Communications in Mathematical Physics. 94: 379–396. Bibcode:1984CMaPh..94..379G. doi:10.1007/BF01224832. Retrieved 9 April 2018. ^ Rosen, N. (1940). "General Relativity and Flat Space I". Physical Review. 57 (2): 147–150. Bibcode:1940PhRv...57..147R. doi:10.1103/PhysRev.57.147. ^ Weinberg, S. (1964). "Derivation of Gauge Invariance and the Equivalence Principle from Lorentz Invariance of the S-Matrix". Physics Letters. 9 (4): 357–359. Bibcode:1964PhL.....9..357W. doi:10.1016/0031-9163(64)90396-8. ^ a b Thorne, Kip (1995). Black Holes & Time Warps: Einstein's Outrageous Legacy. W. W. Norton & Company. ISBN 978-0393312768. ^ a b c d Bär, Christian; Fredenhagen, Klaus (2009). "Lorentzian Manifolds". Quantum Field Theory on Curved Spacetimes: Concepts and Mathematical Foundations (PDF). Dordrecht: Springer. pp. 39–58. ISBN 9783642027796. Archived from the original (PDF) on 13 April 2017. Retrieved 14 April 2017. Taylor, E. F.; Wheeler, John A. (1963). Spacetime Physics. W. H. Freeman. ISBN 0-7167-2327-1.